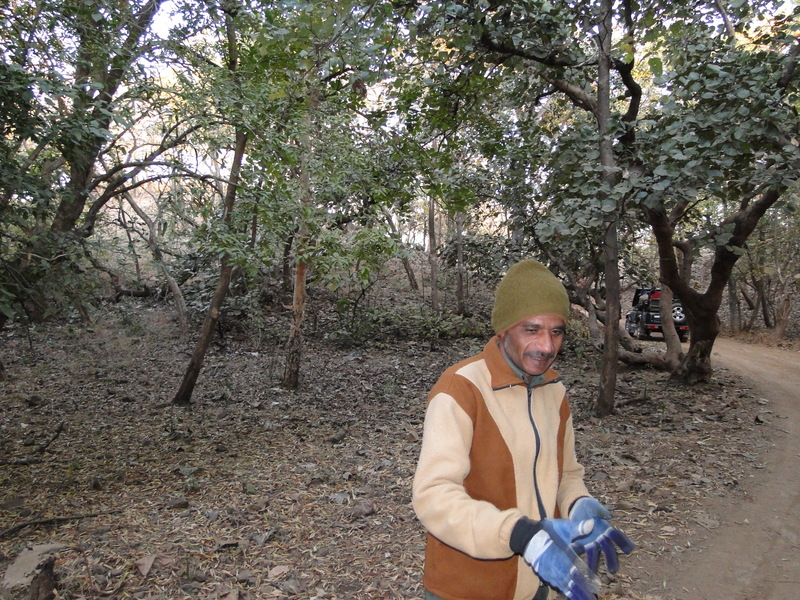 When we were in the Gir forest, Abu bhai (=our tour guide) spoke volumes about how nice a morning safari is. Its also said that a morning safari is a good time to catch the lion especially the cubs because they made their way into the forest and to the ponds inside to drink water. Generally the morning is a good time to see any animal or bird because the weather is extremely pleasant. Although the morning safari did come with its own T&Cs, the cold temperatures and the prospect of waking up in the wee hours on a vacation. Abu Bhai sold us the idea of the Morning Safari though. He said seeing the safari looking hot and dusty in the afternoon was a common thing but the real grind was in seeing the day unfold right there in the midst of nature. So the next thing we knew, we’d signed up for a morning safari. 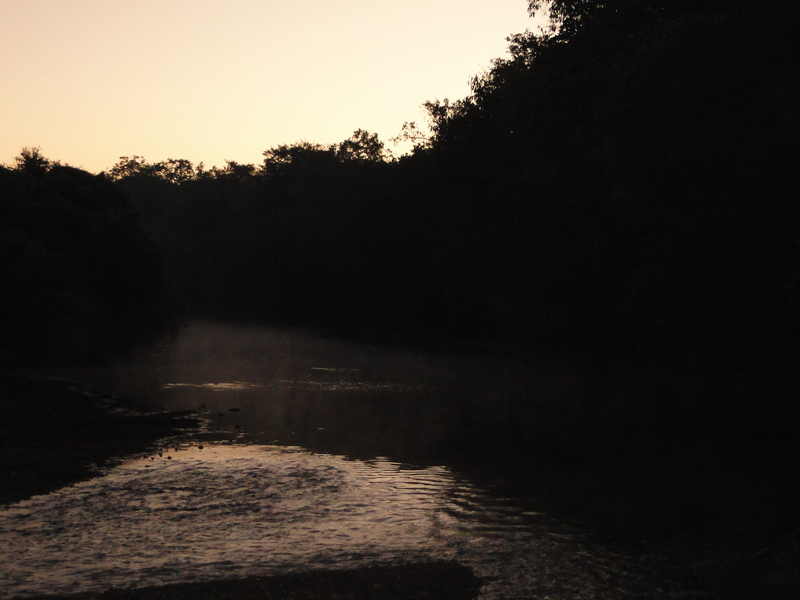 At 5AM we reached the Gir sanctuary and booked tickets for another safari. And my dad asked for Abu Bhai to be our guide again. When Abu Bhai came to us he was surprised that the authorities allowed that. Its not common for the authorities to assign the same guide to a tour. The process of assigning a guide is random so as to eliminate bias. And might i say, this was far too much an adventurous step we’d taken. Usually we read up about a place, research, ask the locals and then go. This was the first time we’d actually decided on the spot that we’d go for the morning safari and actually got to doing it. The whole world around us looked deep in slumber. It was dark all around save the Sanctuary Booking Office. Once we were allotted a vehicle, driver and a route, we set off. We got allotted Route 6 which is the opposite of the Route 2 we got the last time. So we had hopes of seeing some lions or cubs coming out to have a drink at the pond. When we drove inside the Forest, the first thing that struck us is the silence. It is incredibly silent in the Forest. Our old and clattering jeep sounded so loud that we were worried for a moment that all the birds and animals would hear us and run away. Dawn’s rays were breaking into the Forest, painting the leaves a beautiful golden and ushering in a new day. It was a beautiful moment. The Forest was so cold, we had to wear a jacket and a woolen cap over our ears to stay warm. Our fingers were frozen though. There was a point where we stopped. There was another jeep which was stuck because its motor wasn’t working. There was nothing we could do. 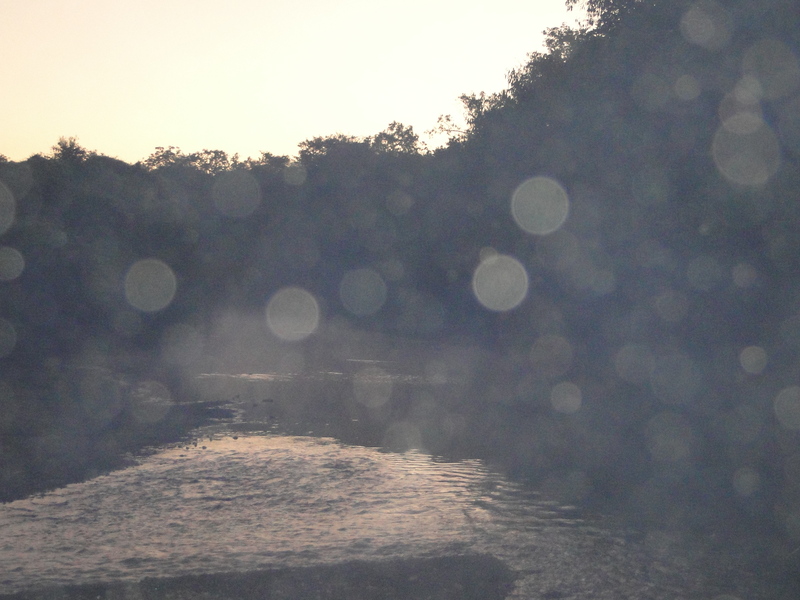 While we waited for a patrol jeep, we stood hearing the cicadas and other insects welcoming dawn. If you go into a forest just before dawn and wait until the sun’s first rays paint the world spectacular, you’d notice how Nature celebrates the arrival of another day. Animals wake and smile, insects buzz, birds chirp. There is celebration and gratitude for the new day. Its a subtle habit that we need to pick up too, celebrating every moment!! There was a point where we waited for a while. The spot overlooked a pond and there was a pug mark just before we went. 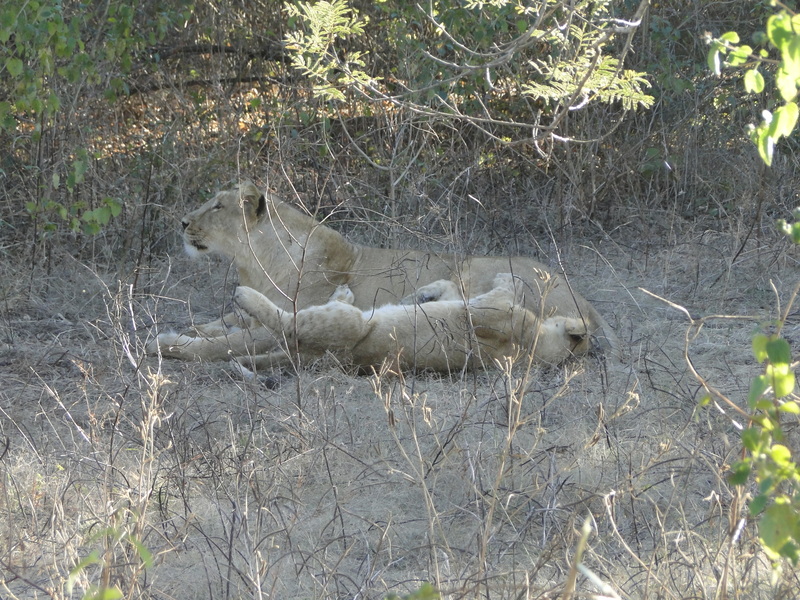 But Lady Luck didn’t favour us that day and we didn’t spot a lion/ lioness/ cubs. But what we did spot were a lot of birds. It was a bird lover’s paradise. 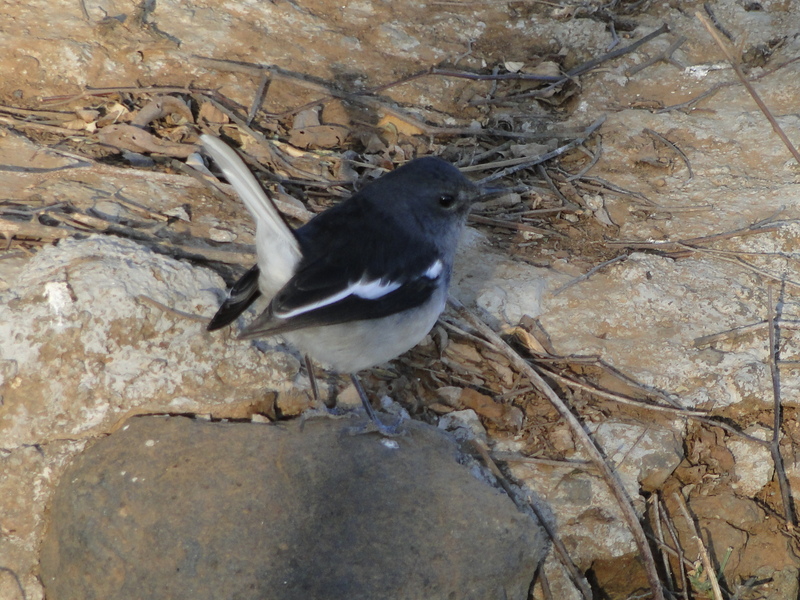 We could see so many birds, few of which we were lucky to capture. Some birds were enjoying a morning meal while some storks played in the pond. It was beautiful to watch. Our guide Abu bhai could rattle off the names of ALL the birds we saw. It was amazing. I wondered how life would be for these guides. Spending their time with nature in the Forest every single day except the monsoons when the park was closed to visitors. People from the Cities are so ambitious and in so much of a hurry to climb ladders, while some people in the villages in pockets of India have already climbed their ladders and are at peace with what they do. It is nice looking at such people. Plus Abu Bhai knew the ways of the Forest and the flora and fauna there, which was no mean feat let me tell you. There was a spot where we saw a Kingfisher Bird waiting to catch a small fish for breakfast. It was fascinating. We just had to stop and watch. The thing is, none of these birds flew when we stopped to see them. They say birds and animals flee and react only when they feel threatened. I guess the birds are used to jeeps coming and stopping, making no sound or an attempt to harm them. Its actually quite disappointing to come to a Lion Safari and not see any. 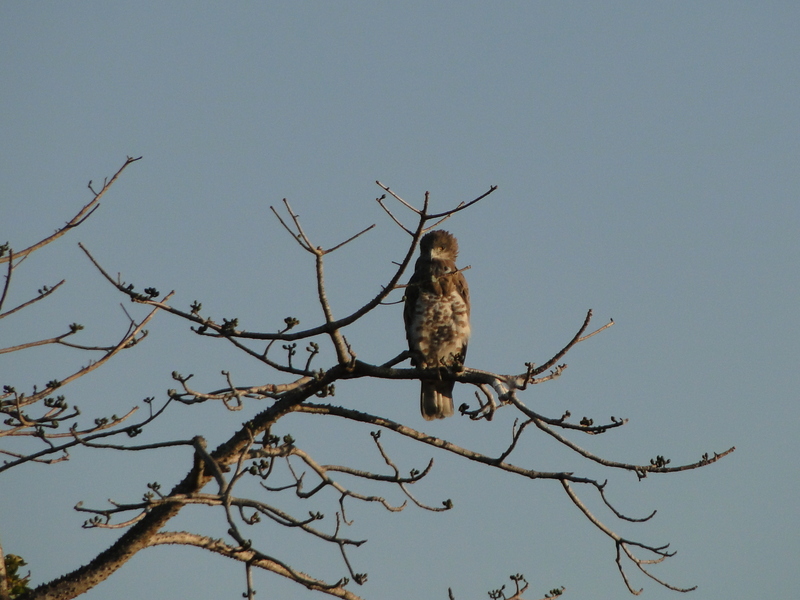 But the birds are a delight to watch too. 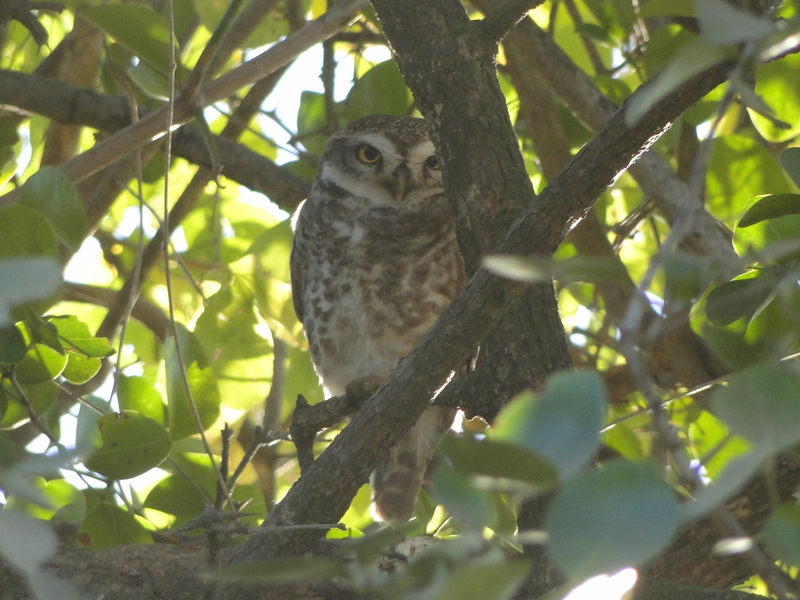 A Rare Brown Fish Owl. Was a task hunting for this geezer!! There were of course deer which were sauntering around. 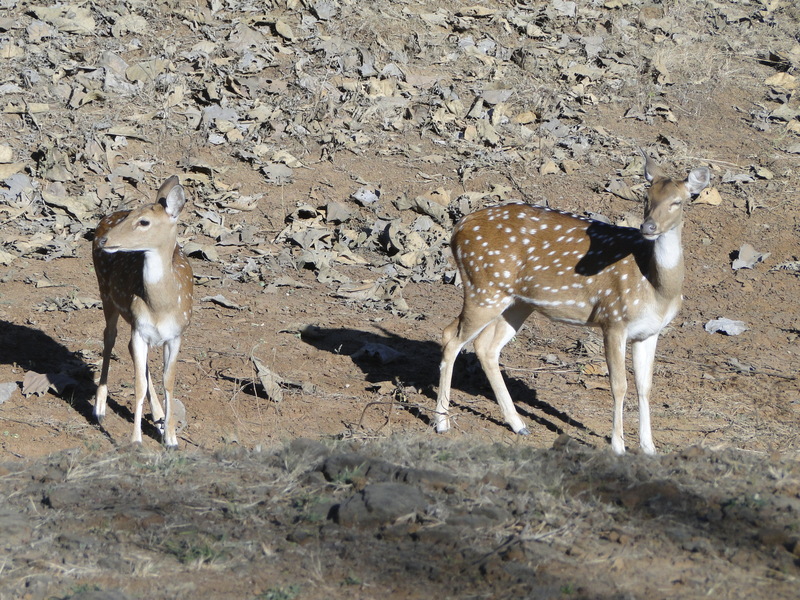 The spotted deer always make good watching. The way they move around in groups for everything they do was nice to watch. The sun made their spotted hide look golden. It was beautiful. We hardly realised when time was up. Most of the journey was looking for any sign of animal activity which we weren’t blessed to see. Even though we didn’t get a lion spotting, there were so many birds we saw and we saw fog lifting off a lake which looked like there was steam rising off the lake. Also the beautiful morning which we experienced in the quiet and cool Forest was far better than the one we’d be experiencing waking up late in our beds!! Stay Tuned for More Gir Travails!! The Gir Forest Reserve has one of the most dynamic teams which is dedicated to make the lion survive and also ensure that the flora and fauna alongside is intact if not increasing. There are so many initiatives and a constant check is kept on the health of the lions and their movement across the park. Fact: 1. 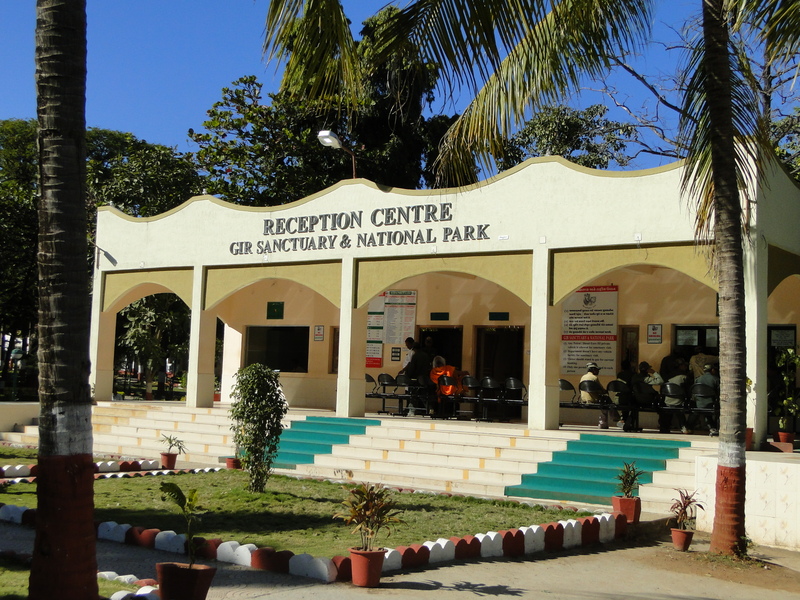 Although the Gir Sanctuary is 1412 sq km reserve, only a small part is open for tourists. 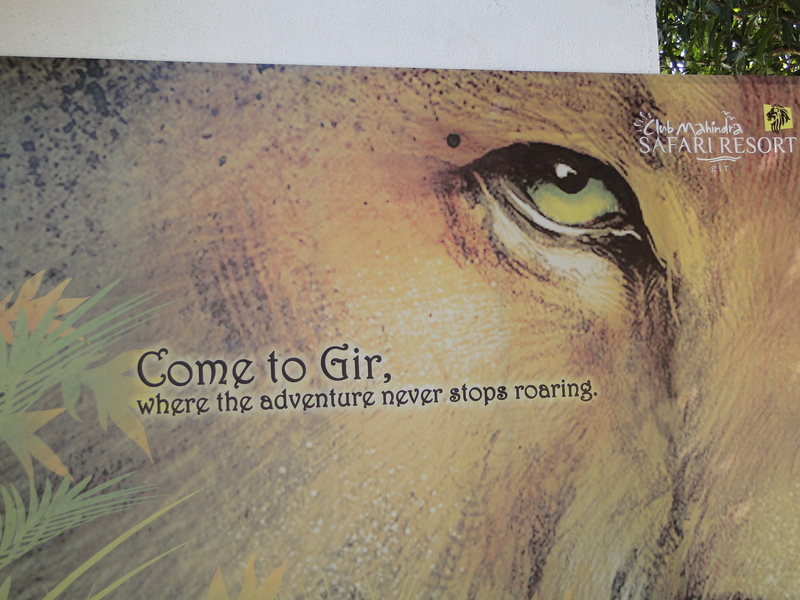 It is also said that the best time to visit the Gir Sanctuary is in the summer months of April and May. But one would question this. Q: Why should you go to Gujarat of all places and go on a safari in the sweltering heat of the Indian Summer?? A: The summer is the best time to see as many animals as you can because they all come out to drink water at various spots. Also, the summer is where lion spotting is at a peak. Now your hotel probably reserves you the spot at the sanctuary for an ‘Afternoon Safari’ but they will definitely add their own charges along with it so if you have your own vehicle or are close to the Park, then I’d suggest you book your own safari. 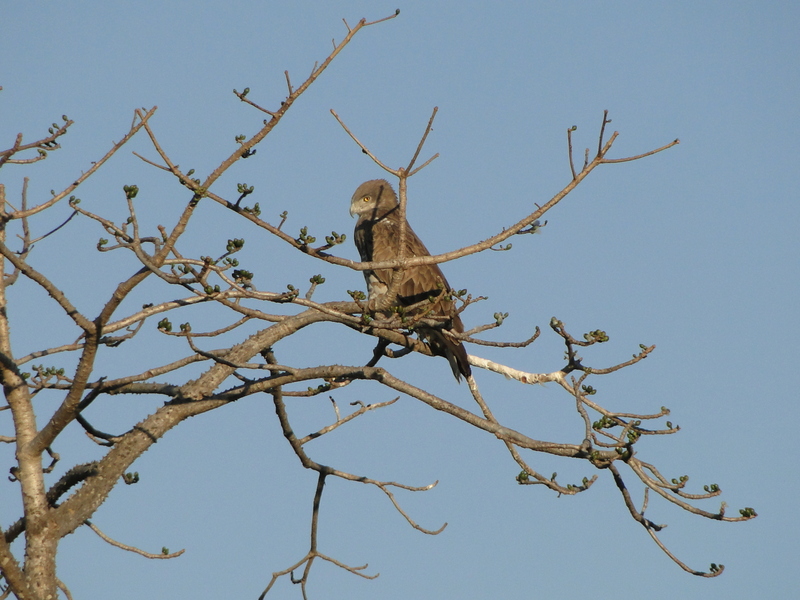 The Safari charges are nominal (=Rs 1750) and it also include a guide who is sent with you to help you identify the various species that you manage to see. Often (=as we found out, always) the guide spots fauna for you, which are things that you wouldn’t even notice. The guides have their own code of letting the fellow guides know that a lion’s on their way so It is essential that you DO NOT tell people you meet about lions that you saw because it gets your guide in trouble. So we decided to go on the afternoon safari on 17th Jan. The afternoon safari starts at 3:30 and you are out by 6. The park is shut in the evenings and nights and entry is prohibited with harsh punishments. So by and by we were allotted Route 2 which is supposed to be the best route as far as lion sightings are concerned. Our guide was Abu Bhai (who tuned out to be a good friend). At 3:30 we set out for our Afternoon Safari. At the gate, the guide is required to get the receipt and the vehicle permit checked so that no unauthorised vehicle goes into the Sanctuary. 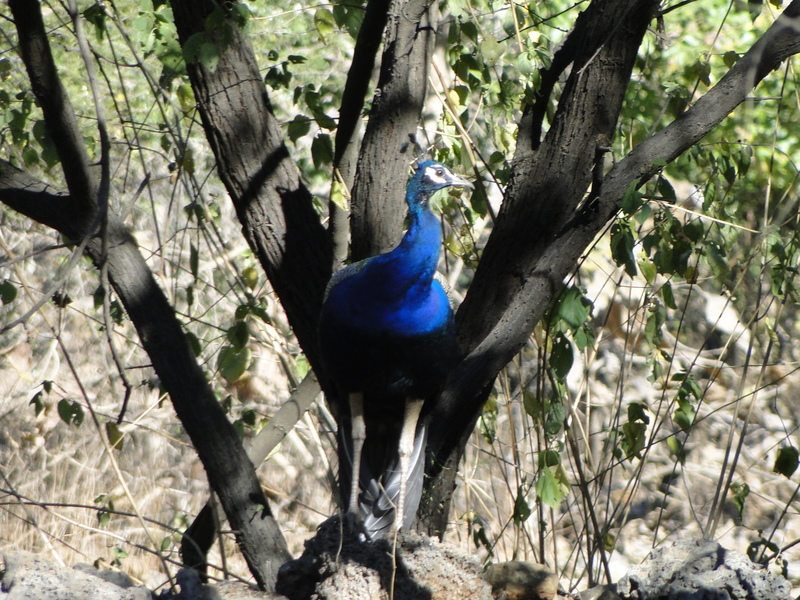 As soon as we entered, we saw a peacock as if it was waiting to welcome us. The old jeeps we were travelling in made quite a noise. 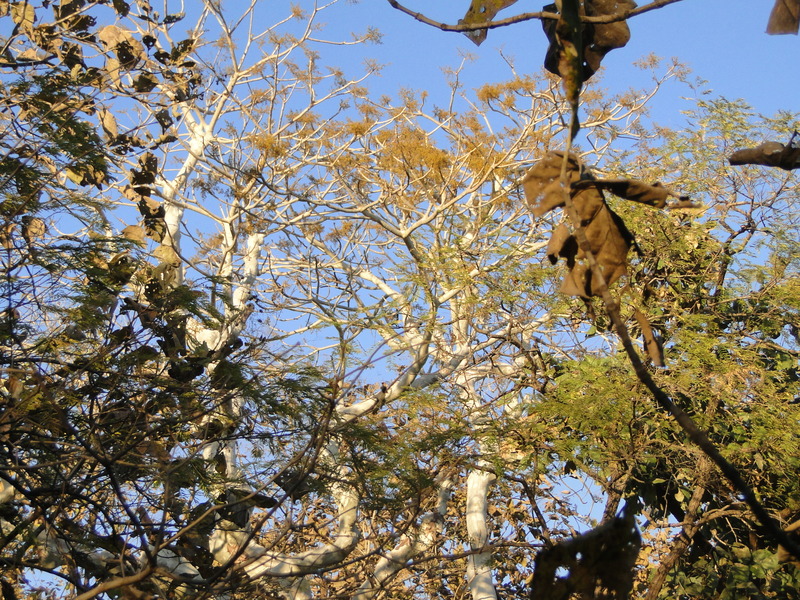 All around us, there were trees covered with dust, with brown prevailing more than green. Suddenly the guide, (=Abu Bhai) asked the driver to stop the jeep. We were quite puzzled as we couldn’t see any animal or bird. Then we saw a couple of paw prints in the dirt. 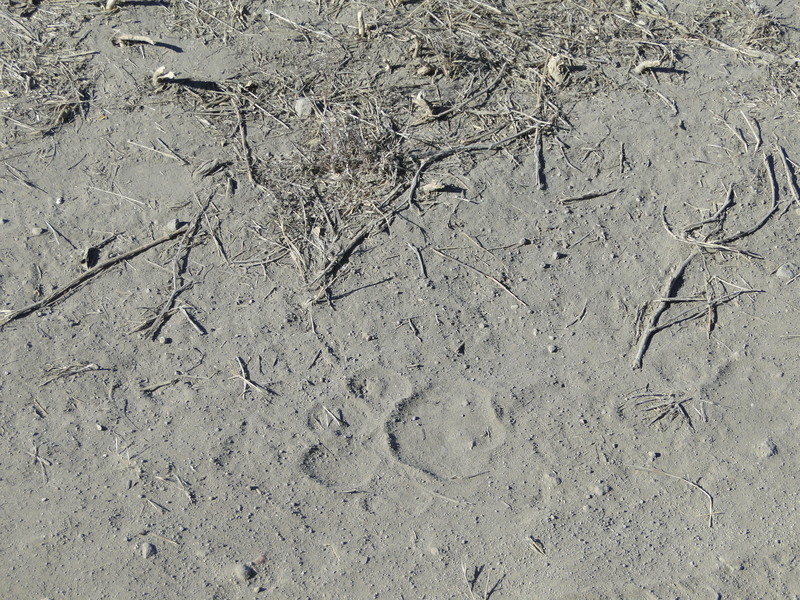 Looking at the paw prints, Abu Bhai reckoned that a lioness with cubs had been on this way some while back which increased our chances of sighting a lion. 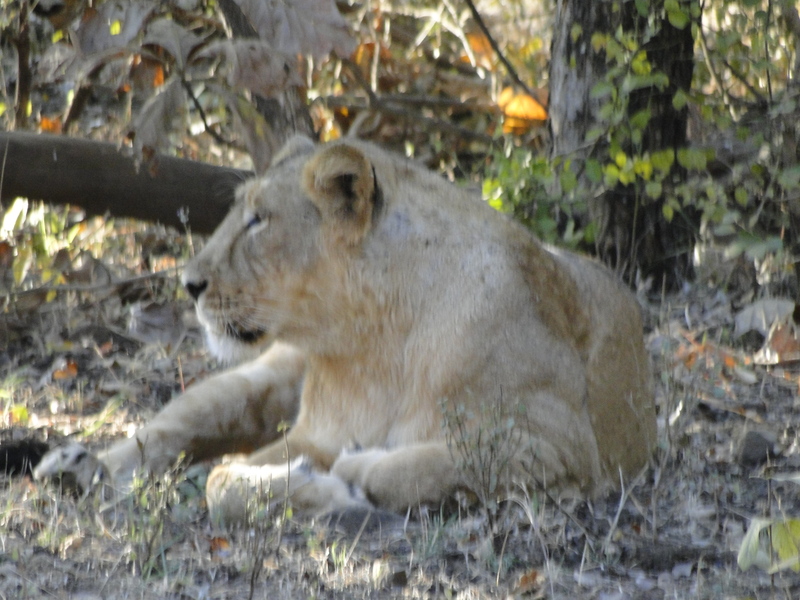 The guides and the other forest officials do their best to make your safari worthwhile by showing you lions. The Forest Department, in order to keep a strict watch on the lion population, sends trackers who play on their lives and follow the lions to check their movements and also keep a watch on their general health. If during your Safari, you run into a Tracker (like We Did 😛 :P) it means there is a lion/lioness/cubs nearby!! 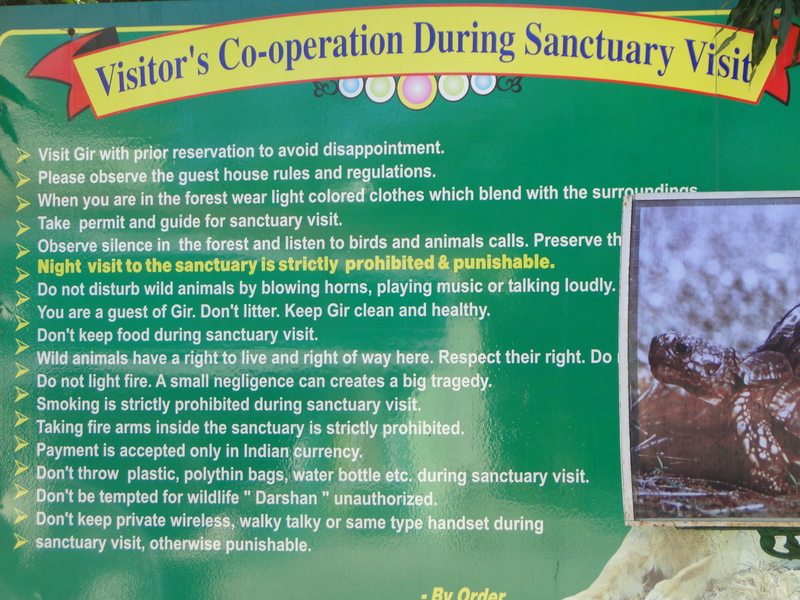 We did see a lot of spotted deer, the ones that we saw in the Devaliya Interpretation Centre. We also spotted a green bird and we drove through a small pond. Then we noticed a basti (=settlement) of tribals called Maldharis. The Maldharis are tribal people who live inside the Gir Forest. They have been there for decades and they live in harmonious co-existance with nature. The Forest Department allows only the Maldharis to settle in the Sanctuary, this being their home for decades and does not allow others. Maldharis are mostly uneducated and work in menial jobs earning a pittance. But they have intimate knowledge about the forest and its functioning and are a valuable asset to the forest department. Yet, because of increasing population and the spread into deeper areas of the forest, the Department has a problem at its hand. We took a turn at a point where you could see the hills and it was a beautiful sight. And there was a person who came out and spoke to Abu Bhai and to our delight it was a tracker which meant there were Asiatic Lions nearby. So we waited patiently. Also we noticed that there was a Forest Patrol Officer in the bushes. These officers patrol the tourist paths to make sure that the tourists do not stray and wander or litter. If you’re caught, then a strict procedure is followed I’ve heard. While we were waiting we ate a few chocolates (=Power Munchies) being careful not to throw the wrappers anywhere. Even though it was around 4:00 it wasnt hot in the forest. 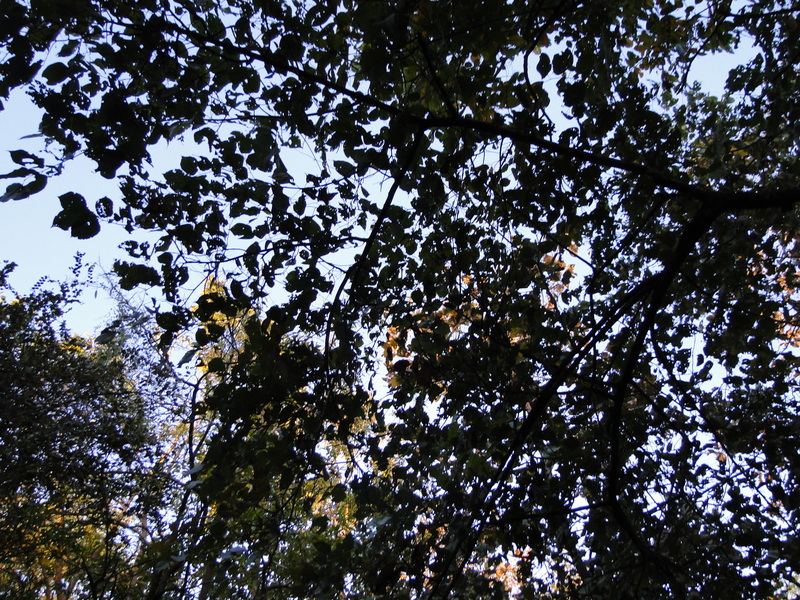 The forest is densely packed with trees. shrubs and undergrowth of grass and other flora. So those act as natural temperature monitors. There was a time when we drove through a thicket of forest and the temperature drop inside the glade was almost 3-4 degrees. well back to the lions. 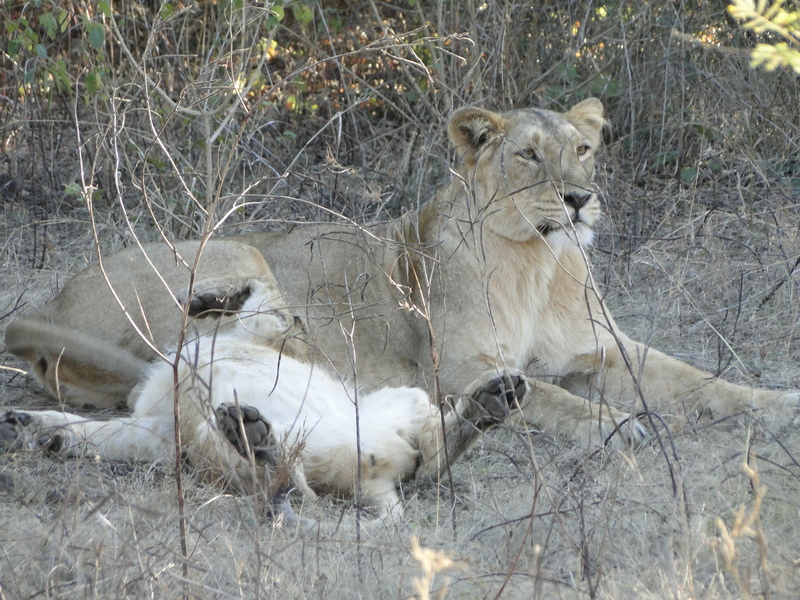 So we waited our turn and drove through to see a lioness playing with her cub, well it actually wasnt like that. 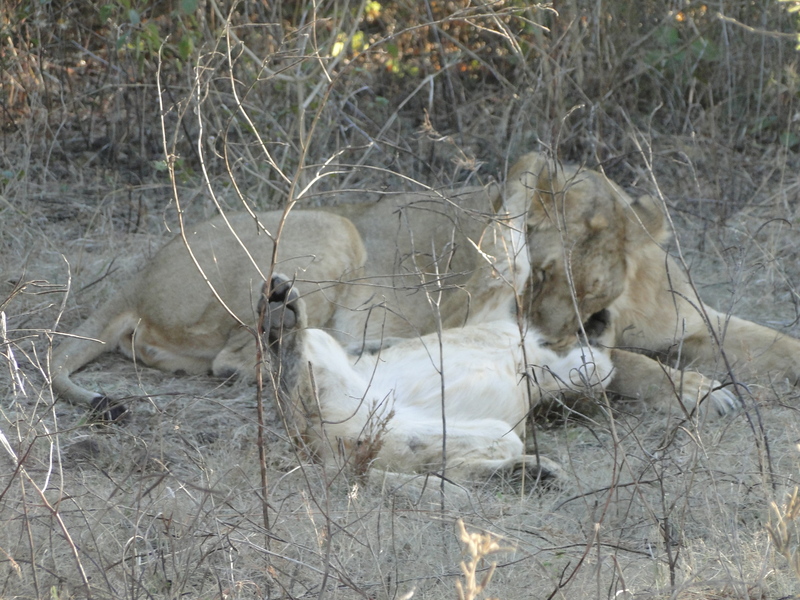 The lioness simply looked bored while the cub poked, lazed and played with her. I guess the heat was bothering the mummy along with the cub because once she just grabbed a bite off the cub telling it to mind its own business. We could have stayed there forever watching this exchange but our driver took us ahead where a teen cub (=duh she was a little grown up, looked moody n didn’t indulge in games with the cub!!) Also she was hidden amongst some dry grass so we couldn’t get her picture properly and i know it was a she because she didn’t have a mane growing!! After our lion fantasy, (=we were darn lucky few people get to see what we saw, lions playing with each other, a cub, etc etc) we drove on ahead. To our surprise (=and Super luck) there was another lioness ahead. But she was surrounded by jeeps with many people chattering as usual. What I don’t understand is the need to converse and gossip among yourselves as if the animal u see is a model i mean you’re in the jungle so doesn’t it seem right to shut your trap for a while?? Amartya Sen rightly calls Indians argumentative, we feel the need to talk always even without reason. Finally our guide got others to shut up. It wasnt a picnic at a zoo really. I urge tourists who have plans to go to Gir to please respect the place you are at, spare the jungle and save the chatter for afterwards. We would have had a chance to see a third lion but the tracker said that the lioness (=in this case) was hidden and could move anytime so it wasn’t worth the drive. So we went on ahead. We also spotted the ‘Ghost Tree’ (=Ooh Spooky). 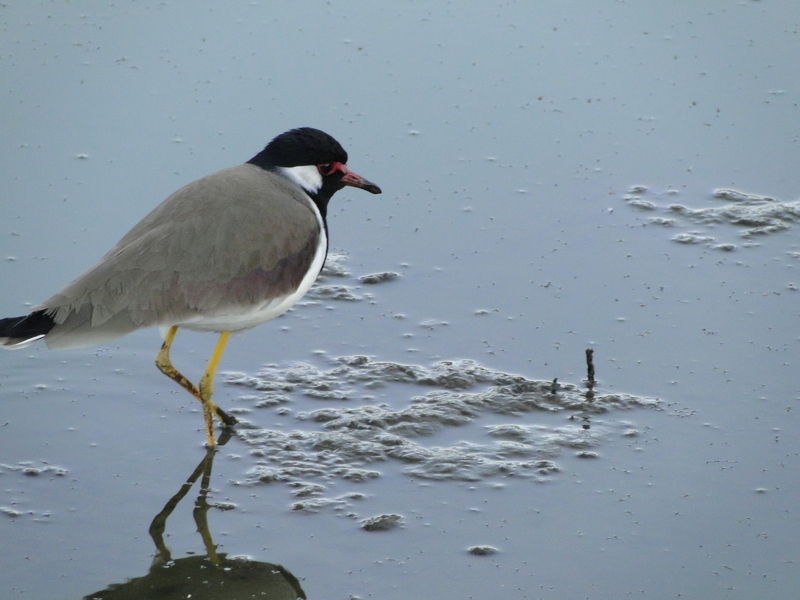 It’s supposed to be a native to Australia but survives here because of migratory birds bringing seeds in their droppings. 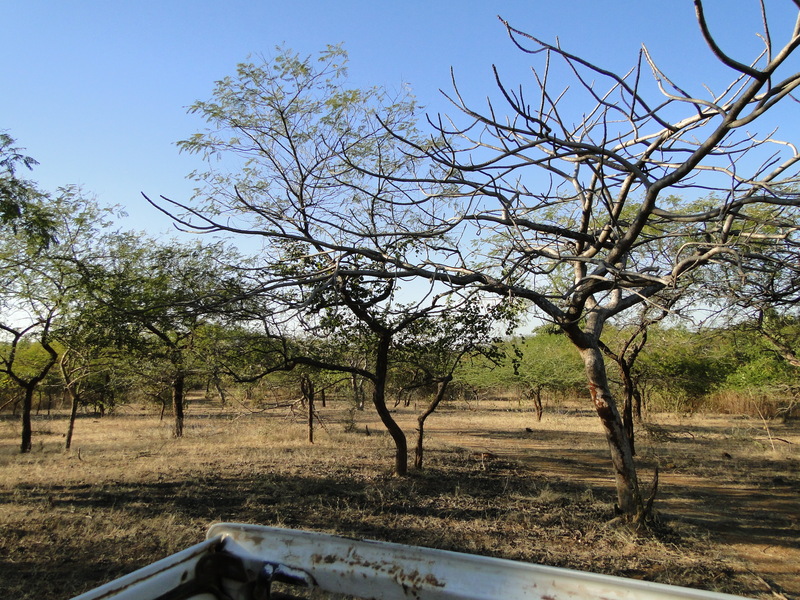 We drove through a thicket of trees, also called as the ‘Dark Forest’ (=Aww quit it it was nothing like the Forbidden Forest) and through red muddy tracks (=as opposed to brown tracks before) to make our way out of the Safari. On the way we also crossed a railway line, from i think Rajkot to Somnath that passes through the Sanctuary borders. It’s a narrow guage railway line and there was a station called Sasan, Gir \. That must make good watching, passing through the Sanctuary. We decided to explore the famous Mysore Palace that day after our lunch with Swaroop. There was some festival going on that day because we saw ladies wearing their best and carrying pots and flowers on their head. That took up traffic for a while. But much to our chagrin, there was a huge line waiting to get into the Mysore Palace, it being a huge attraction for people pouring into Mysore. Papa went and stood in the line while mum tried to get a ticket from the counter and surprisingly, the man at the counter gave her tickets without asking her why she was cutting into the line. I guess people who sell tickets are so used to people cutting in the line that they don’t bother with asking. Also one advantage of the crowd was that many people were getting into the palace without buying tickets which meant that that guards at the entrance weren’t doing their job properly. So we mentioned that to the guards who seemed embarrassed and started checking tickets after we passed. 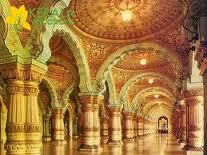 Photography in the Mysore Palace is not allowed so the camera had to be kept in a special locker. But we carried it with us nonetheless and asked the guards special permission to keep it with us promising not to click photos inside. People are not allowed to wear shoes into the Palace. This would make it easier to clean it. Also there are audio tapes in 20 languages here. We’d seen audio tapes in Palaces abroad like Hampton Court which was the summer residence of King Henry VIII. Its a nice way to make people aware of the history behind all the paintings and what each room is and its significance. It also explained about the times when kings used to stay in the Palace describing the various festivals, marriage and the routine of the king. It also shed light on the ways of living and elaborately spoke on the crest of the dynasty. In this case, the crest/coat of arms of the Wodeyar Dynasty which has ruled Mysore for many years. As the story goes, two young men, Vijaya and Krishna of the Yadu dynasty hailing from Dwaraka in Gujarat came to Mysore, after visiting Melkote on their pilgrimage. The two royal princes took shelter at the Kodi Bhyraveswara Temple, which was close to the Doddakere, from where people of then small city of Mysore fetched water for drinking and daily chore. At dawn, they heard some women, while washing closes discussing the distress situation of the young Princess Devajammanni. The death of her father, Chamaraja, the local ruler, had landed her and her mother, the queen, in trouble. Taking advantage of the situation, the neighbouring Chief of Karugahalli, Maranayaka, began demanding the kingdom and the princess in marriage. Taking the help of a Jangama Odeya, a Shaivite religious man, the two chivalrous brothers came to the rescue of the distressed Maharani and the Princess. Mobilising troops, they killed the Karugahalli Chief and his men and saved the Mysore royal family and their kingdom. A happy princess married the elder brother, Vijaya, and he became the first ruler of the Yadu dynasty. He assumed the name Yaduraya. 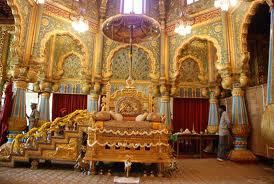 Thus the traditional founding of the Wadiyar dynasty took place in 1399 with Yaduraya. Since then, 24 rulers have succeeded in the dynasty, the last being Jayachamaraja Wadiyar. It is during his period, India won freedom and later monarchy was abolished. With that ended the reign of the Mysore Maharajas. The audio tape was the best part of the trip because it was so informative. But i would have to add its a rich man’s tool, because one audio tape comes for Rs. 200/- which the common man would not be bothered with. The Palace was beautifully maintained and the paintings were beautifully kept. The rooms were exquisite and were beautifully detailed in the audio tapes. I mused on the Palaces i’d seen in Rajasthan and this and the difference was there for all to see. There were no spit markings here, no broken glass, no people treating the Palace like a park. The people were fascinated with the Palace and it still had its aura. The Palaces of the West were in disrepair and the people there needed serious training in how to manage it. Also the history about the Palaces was not documented properly and guides were only out to make money they weren’t people who were genuinely interested in the history of the place. 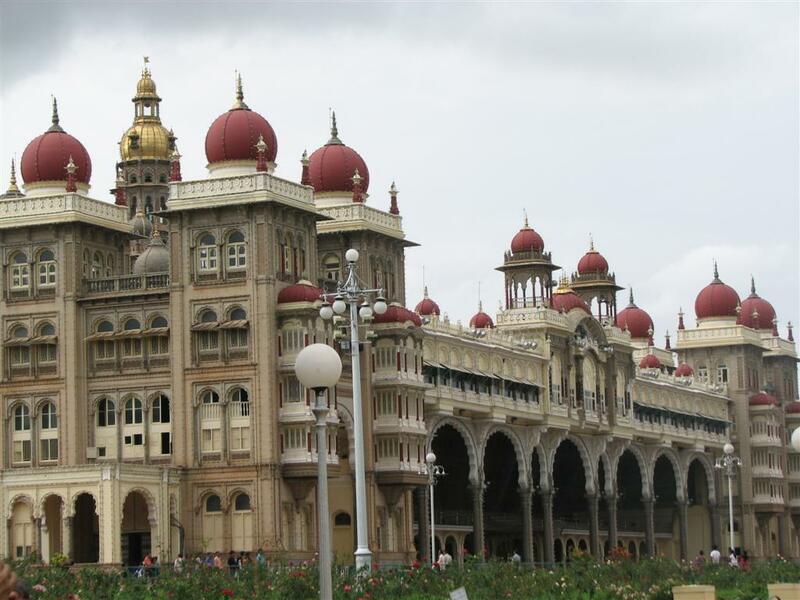 The difference in attitudes was the reason the Mysore Palace looked the way it did. Plus the paintings by Raja Ravi Varma made history come alive. After going through all the rooms including the King’s conference chamber, the Diwaan-e-Aam(=courtyard where the king could address all the commoners) and through other chambers, we came out. There we had to give up the audio tapes and we could buy photos of the Mysore Palace (=authorised people selling the photos) and books on the Palace. These funds would be used for the upkeep of the palace. The way the Palace was maintained made me happy that somewhere efforts were being taken to preserve our monuments. After getting our shoes, we left for the hotel. We had some sugarcane juice. Outside the Palace, there were many sellers selling stuff like incense sticks(=agqarbatti) and carpets, curios. We got pictures of the West Gate in the setting sun. 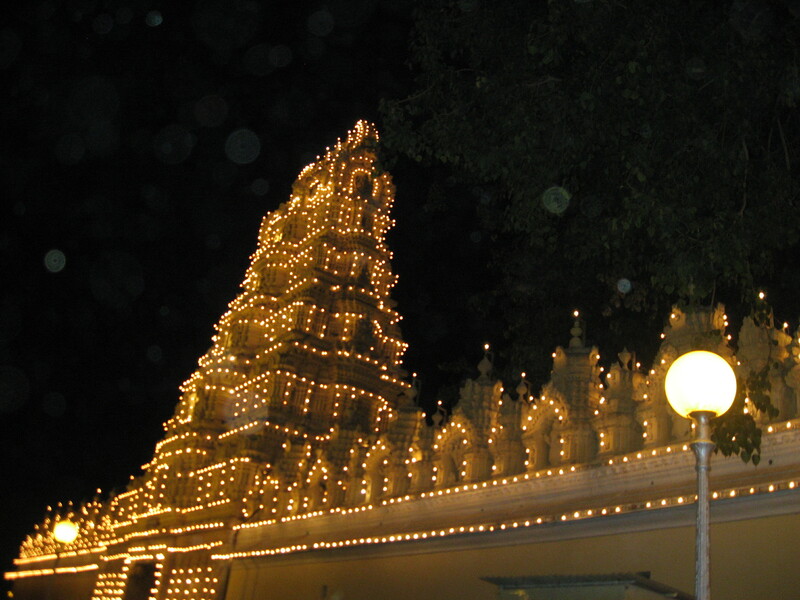 After that we visited Swaroop’s place and then visited the Palace to see the illumination. Nothing and i mean Nothing prepared us for the sight we were to see. The Palace looked so brilliant lit up that we couldn’t imagine looking at it in any other way. Stunning is what i can say. We had no words to express it. We could only stare. There were many people who came to see the palace illuminated. There were a lot of travellers and foreigners who came along with big backpacks. I dont have much to say except you must go and see the Palace once atleast. Pick up your bags and go!! !